Cornflake Chicken Fingers - chicken tenders coated in crushed cornflakes, parmesan cheese and Ranch dressing mix - SO easy and SOOO good! Kids gobble these up! Ready in 15 minutes!! You can make these ahead of time and freeze them for a quick meal later. These might be the best chicken fingers I've ever made. The chicken is coated in cornflakes, parmesan cheese and ranch dressing mix. What's not to love? I crushed the cornflakes in the food processor so they were super fine. I also double dipped the tenders so they were super crunch and tasty. I can not stop thinking about these chicken fingers. They are seriously delicious!! I will be making them again this weekend. In a shallow dish, combine cornflakes, cheese, and ranch mix, set aside. In another shallow dish whisk together eggs and milk. Dip chicken tenders into egg mixture; then coat in cornflake mixture. Repeat - dip in egg mixture and back in the cornflake mixture. Place double coated chicken tenders on cookie sheet and spray with cooking spray. With the corn flakes, parm and ranch....they had a lot of flavor. Ranch dressing *mix* would be in the packet. This just went to the top of my "must make list"!!! Here in Australia, we oan't get ranch dressing in a mix-up packet form, us already make up in bottles.What could I do to make up this recipe so the flavours stay the same? Oh my, the chicken looks so crunchy. YUM! I just saw a box of Kellogg's crushed cormflakes next to the breadcrumbs at the grocery store. I think I'll be making this very soon. They look great. I might just have to try corn flakes in my chicken nuggets to see if I can step them up a notch. The Parmesan cheese sounds like a nice addition too. I'll leave out the ranch dressing since I can't stand the stuff. 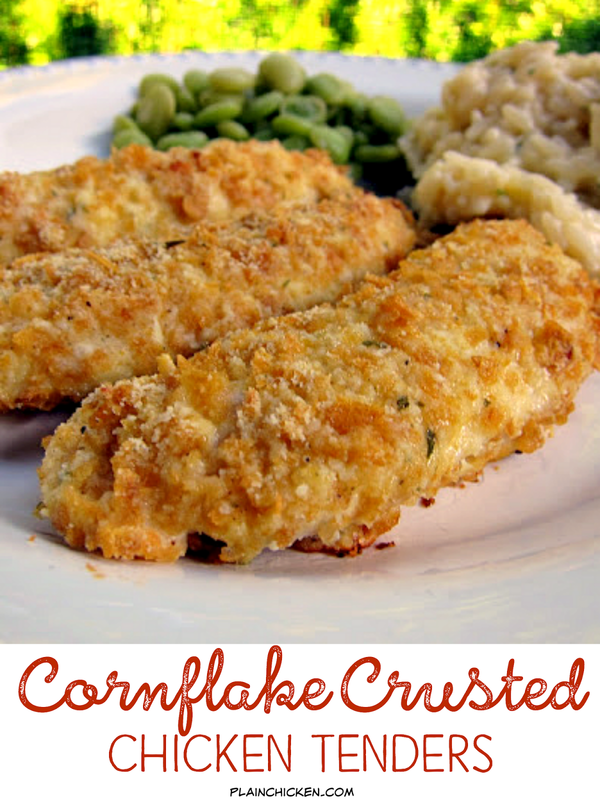 I love these, my mother made them all the time when we were growing up (sans the ranch dressing) - back then, you could buy a box of cornflake crumbs (but I haven't seen those in a long time) - it was one of our faves ! Is it bad that I'm wondering how this would be with Frosted Flakes? My son's allergic to eggs. Is there something else I can dipped the chicken in to make the coating stick? Just made these tonight and they were a HUGE hit!!! Both of my boys and the husband loved them. This will definitely be a repeat many times over!!!! I made the chicken fingers for my husband's birthday and we loved them. I made them with mashed potatoes and green beans with almonds as side dishes. Thanks for a great recipe! The rice in the background looks yummy! Do you have a recipe for that?